The following bunch of B&W's come from the Life Magazine archives. Above is 'Woodside', the James Abercrombie Burden estate in Syosset, built by Delano & Aldrich c. 1916. 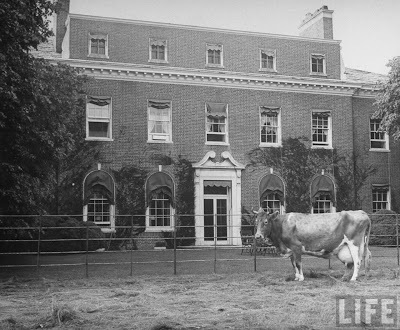 The estate comprised over 120 acres and included stables and a farm group. Apparently at some point they let their cattle onto the rear of the property. 'Northaw', the Sir Thomas Ashley Sparks estate in Oyster Bay Cove. Built c. 1900, the house sat on over 250 acres. It was demolished after a fire destroyed most of the structure c. 1968. It's a little depressing looking at the pictures in Randall's book after seeing it in such good shape above. I could be wrong, but the first picture appears to be Woodside, the James A. 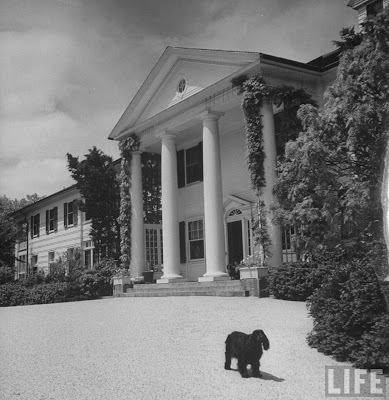 Burden Jr. estate in Syosset.